Bijou - A gem of a little salon in Skaneateles: I always said I'd say..."I knew him when..."
I always said I'd say..."I knew him when..."
Another exciting thing that happened to me when I was at Anyela's for the Fab event...was I ran into a parent of 2 boys that I used to cut their hair. They were my first clients when I moved to Skaneateles, some 13 years ago....I can't even imagine how old he is now, nor can I recall how old they were when I started cutting their hair....These two boys were the way I wanted my boys to become! Nice, kind hearted, able to talk to adults, just great kids! The Slater boys! Mike and Rob! Rob was the older one, and if I'm correct I think he was already in at least 8th grade...maybe older. Mike was the younger one and soo funny and interesting to talk to! I always looked forward to both of their conversations and stories! Mike was a swimmer, a very good one, I dulled many o' shears on that head of hair...chlorine build up kills our scissors. I used to tell him when he made it to the Olympics, he would have to become an endorsement for a scissor line, so he give me new shears! I remember him telling me that his coaches used to ask him to shave his head...he would flat out refuse and would say the best line ever! (oh it WAS a long time ago, so forgive me for paraphrasing, and Mike if you read this, feel free to correct me!) "Half of being a winner is looking good!" I have so many kids that all their teammates are shaving their heads or making mohawk's and such...I always tell that story! 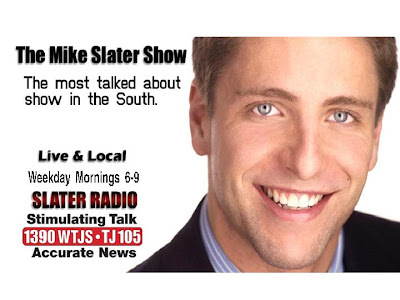 Okay, so what I learned was pretty cool...Mike Slater..the kid I used to say..."One day...I'm gonna be able to say...I knew him when...." is a radio personality in the Tennessee! AND get this...he too, has a BLOG!